Tomatoes remind me of my childhood during the humid summer months in Philly. My mom would prepare slices of Jersey Beefsteak tomatoes slathered with mayo and salt & pepper, usually alongside an ear of corn and some grilled chicken. For lunch she’d make simple cheese and tomato sandwiches. The tomatoes were juicy and flavorful and delicious, nothing like the hot house tomatoes that line the grocery stores. Unfortunately, commercial agriculture has destroyed much of the appeal of the tomato. Over time, the hot house tomato gene has been changed causing it to ripe in uniform color at the expense of the flavor. Tomatoes are typically picked green and ripened artificially imparting a mushy flavorless ghost of a tomato. Since hot house tomatoes just don't cut it the best time to eat tomatoes in the summer, when local heirloom tomatoes are everywhere. The heirloom tomatoes are as flavorful and juicy as the tomatoes I remember as a kid. As an adult, I like to akin the them to a fine wine, delicate yet complex and each variety has it’s own unique flavors. 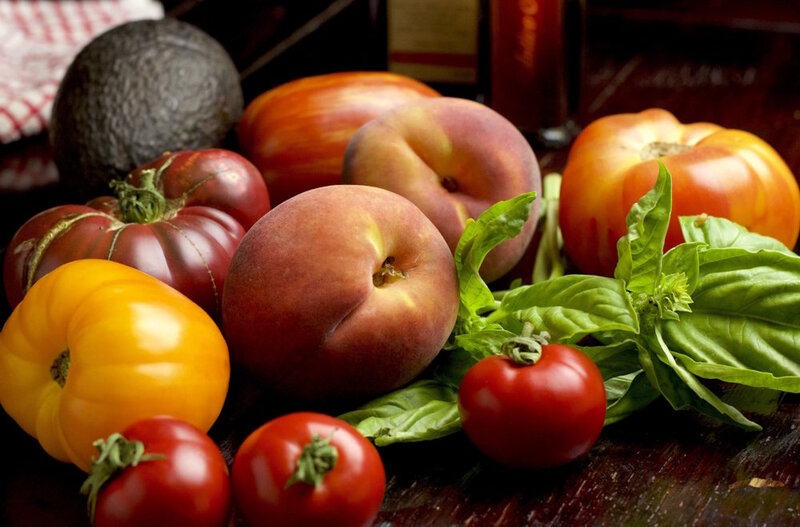 The farmer’s market was overflowing with all types of heirloom tomatoes and ripe yellow peaches and I was inspired to create a seasonal caprese salad. I like to use a variety of heirloom tomatoes in this recipe to impart bursts of tangy flavors against the sweet yellow peaches and creamy burrata cheese. It’s really simple to make and extremely satisfying. Enjoy! Burrata is an fresh semi-soft Italian cheese made from mozzarella and cream.